UNC Asheville heads to the semifinals of the Big South Conference Tournament after defeating an athletic Charleston Southern University team in Kimmel Arena Thursday night. Despite holding a 14-point lead early in the second half, the outcome looked uncertain until senior guard Ahmad Thomas hit a turnaround jump shot with four seconds remaining to put the Bulldogs up 71-66. Head coach Nick McDevitt called a timeout during the Bulldogs’ last possession and designed a play to put the ball in the veteran Thomas’ hands. Thomas shot 50 percent from the field and added three assists, four steals and a block to his 17 points. 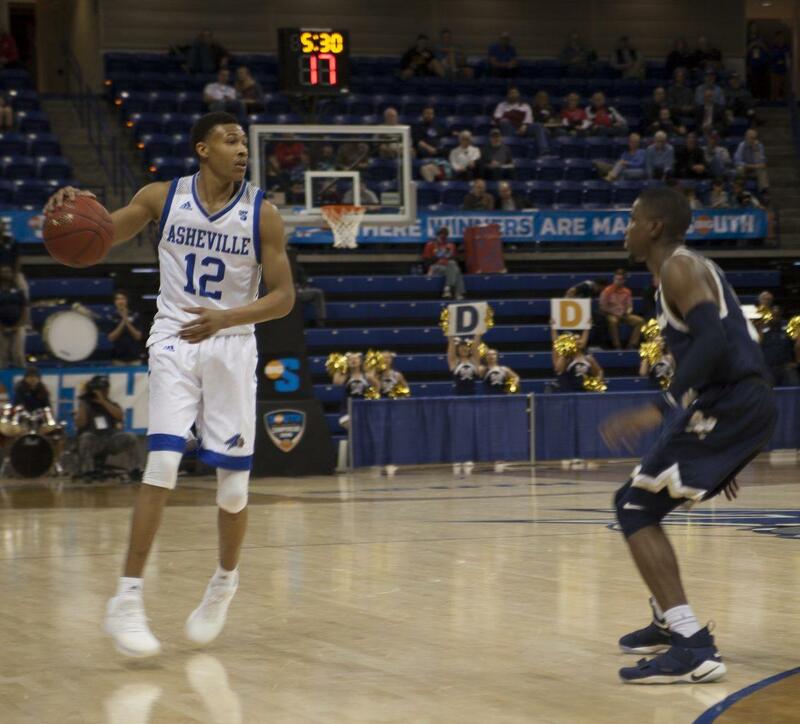 UNCA ended the first half in spectacular fashion when Thomas blocked a shot, found senior guard Raekwon Miller with a full-court pass, then ran the length of the court for the return pass from Miller and drained an open three-pointer. Senior Raekwon Miller faces off against a rival Charleston Southern player. Sophomore guard MaCio Teague led the Bulldogs in first-half scoring with 17 points, as the Bulldogs entered halftime leading 41-34. Sophomore guard Christian Keeling of CSU led all scorers with 24 points and kept the talented Buccaneers team in the game while UNCA struggled during periods of the second half. Thomas’ game winner ended a four-minute Bulldog scoring drought that allowed CSU to bring the game within three points. Sophomore center Jonathan Baehre had what was perhaps the play of the night when he met CSU forward Jordan Jones at the rim and denied Jones the dunk that would have made it a one-point game. CSU lost seven of their first nine conference games, but finished the season strong winning seven of their last nine games and entered the tournament with as much momentum as any Big South team. The Bulldogs earned home court advantage by winning the Big South regular season, an advantage McDevitt credits to his team’s composure throughout the game. “Our crowd was behind us several times. We had a scoring drought of about four or five minutes, but I didn’t think that affected our effort on the defensive end of the floor, in large part because we’re in friendly confines,” McDevitt said. Despite the tough loss, Radebaugh had nothing but praise for UNCA’s program in his post-game interview. The Bulldogs won by a final score of 71-66. Miller finished with 12 points, nine assists and nine rebounds while Baehre added 10 points and one block. UNCA will likely need to win the tournament in order to advance to the NCAA tournament, as teams from the Big South Conference typically do not receive at large bids.